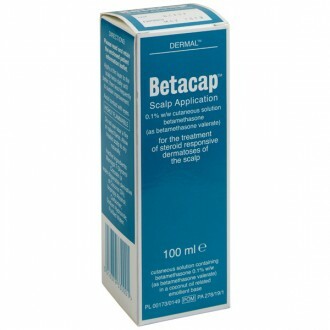 Are you suffering from a painful scalp as a result of dermatitis or psoriasis? Applying Elocon Scalp Lotion is a great way to relieve your discomfort. 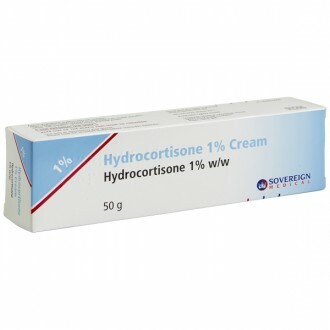 This potent topical corticosteroid contains mometasone furoate, an anti-inflammatory, and can be placed on the surface of the scalp to reduce redness and itchiness. To find out if Elocon is right for you, complete our simple questionnaire for a free review from our qualified UK prescriber. If they conclude that Elocon is your best treatment option, they will issue you the prescription needed to purchase it, and explain to you both how you should use it and what kind of side effects you can expect, if any. Order before 4pm for same-day dispatch in the UK, and let The Independent Pharmacy guide you towards a healthier future. Skin conditions like psoriasis and dermatitis commonly manifest on the scalp, and it’s a very awkward area to have a skin issue. After all, suffering from an itchy, dry and reddened scalp is extremely uncomfortable, particularly if you have plenty of hair to contend with. Given the location, it can be difficult to resist scratching the area, which just makes the problem worse and can lead to even greater discomfort. Elocon Scalp Lotion is specially formulated to deal with skin conditions on the scalp, making it easy to administer and use (even with hair in the way). Just a few drops applied to the affected area each day, for a 7 - 10 day course, will work to significantly reduce inflammation, dryness, and cracking. 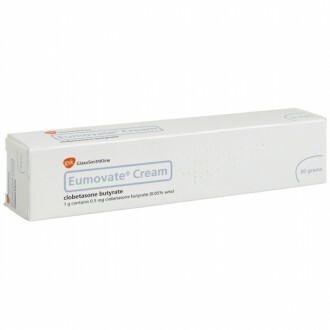 Manufactured by Merck Sharp & Dohme using an anti-inflammatory corticosteroid with vasoconstrictive (causing blood vessels to narrow) and antipruritic (reducing itching) properties, Elocon both moisturises the skin and slows the rate of growth of skin cells (relieving psoriasis symptoms). Elocon causes a reduction in the production of red, itchy skin — calming the treated area and allowing the skin to return to its healthy natural state. Elocon is rated very highly by patients, but it is a potent treatment option, so it can’t be purchased without a prescription. By completing a free online consultation when you purchase Elocon, our team of doctors and pharmacists can ensure the treatment is right for you, especially if the skin on your scalp is itching and cracking on a consistent basis. 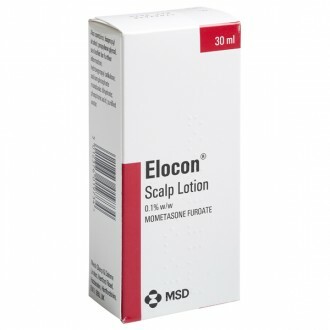 Note that Elocon lotion is safe for us on moist scalp lesions, but dry, scaling and fissured lesions should be treated with Elocon ointment instead, and particularly sensitive skin is best treated with Elocon cream. Elocon lotion is also not suitable for use on open sores. Psoriasis, a chronic skin condition that affects an estimated 1 in 50 people in the UK, causes flare-ups of itchy, red, flaky skin and scaly tissue. These flare-ups are sporadic, usually being triggered by smoking, alcohol consumption, stress, certain kinds of medication, or irritants such as those found in hygiene products. Doctors still don’t fully understand what causes psoriasis, but they suspect that it’s a result of the immune system being too sensitive and trying to defend against infections that aren’t there. 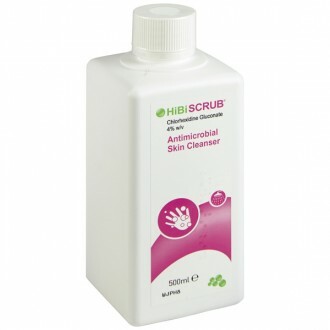 In doing so, it speeds up the development of skin cells, causing inflammation and other issues as skin cells ‘pile up’ on the skin’s surface. While psoriasis flare-ups can occur anywhere, the scalp is one of the areas most commonly affected, being an issue in around half of all psoriasis cases. Why the scalp in particular is prone to psoriasis flare-ups is unclear, but since psoriasis commonly affects areas such as the lower back, knees, and elbows, it may simply be that it develops more easily in places put under particular stresses. The scalp (typically) runs hotter as a result of being covered by hair, the elbows and knees are required to flex, the lower back bears the brunt of physical activity, etc. This line of thinking is mostly speculation, however - we don’t know for sure. 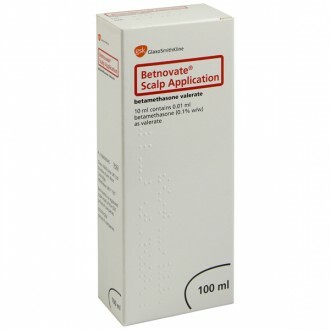 Elocon Scalp Lotion is prescribed for similar conditions as Betnovate Scalp and Betcap solution - eczema, dermatitis, and psoriasis of the scalp. 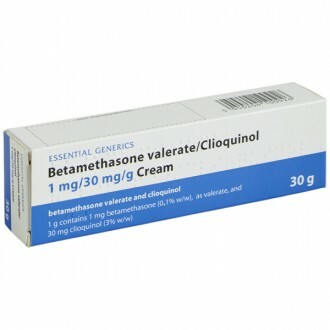 Elocon contains the steroid mometasone, whereas Betnovate and Betacap contain betamethasone. 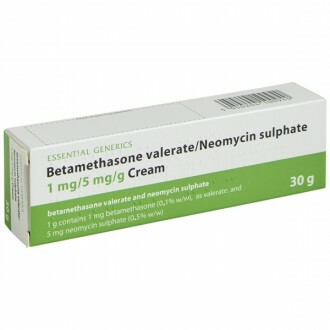 Both betamethasone and mometasone are classed as potent steroids, meaning they are strong and will be effective at treating more severe conditions. As there is little difference in strength between the treatments, it is usually down to personal preference and individual response when deciding on what treatment is best. As Elocon Scalp Lotion is a powerful treatment, you need only apply a few drops to the affected area of the scalp and gently massage until the lotion disappears. 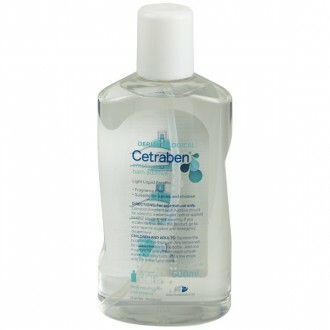 Don’t worry about hair getting in the way; neither wet hair nor dry hair will interfere with the efficacy. This should be done once per day until your doctor advises you to begin scaling back. You should try to apply Elocon at the same time each day, but if you forget and miss that time on a given day, just apply it as soon as you can and then apply it at that time the following day. Even if you feel that your scalp has adequately recovered, do not stop outright without weaning the skin off the lotion through a gradual reduction in application frequency. Such a stop can cause your skin to redden and sting. When using Elocon, make sure to always exactly follow the course of action prescribed for you by your doctor, pharmacist, or nurse, and consult them if you feel uncertain about the treatment. 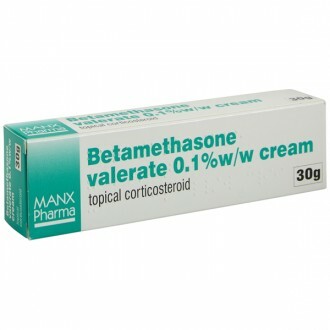 Other side effects that may occur with topical corticosteroids are dry skin, skin irritation, dermatitis, dermatitis around the mouth, and small dilated blood vessels. Isopropyl alcohol, propylene glycol, hydroxypropyl cellulose, sodium dihydrogen phosphate dihydrate, phosphoric acid, purified water. 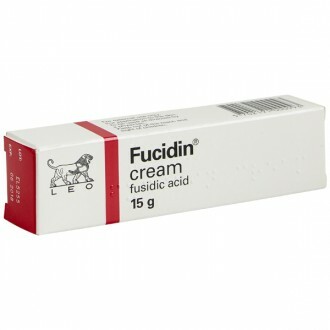 This medicine should only be used on the scalp. Do not use it on any other part of your body. Do not cover any treated areas with bandages or plasters before consulting your medical advisor. Do not apply the lotion in great quantities. Do not use in or around the eyes, including eyelids. Accidental consumption of the lotion should not produce any major problems, but you should consult a doctor if it happens and you feel concerned. 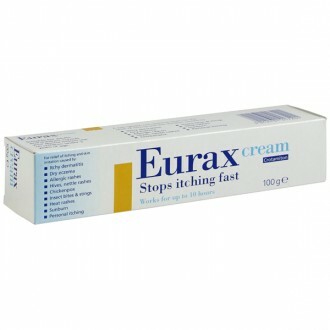 In general, inform a doctor as soon as possible if you ever realise that you have been using Elocon incorrectly. Excessive use of Elocon can produce hormonal effects; in children, this can cause stunted growth or development. Accordingly, Elocon is not recommended for children under the age of 2, and should only be used on a child if fully approved by a doctor. Their course of treatment should last no longer than 5 days, and under no circumstances should you cover the treated areas with bandages or plasters. Following commencement of an Elocon treatment plan, if your scalp becomes irritated or sensitive, you think that you have developed a scalp infection, or you develop blurred vision or experience other visual disturbances, consult a doctor immediately. Are Novasone and Elocon the same product? Technically, no. Novasone and Elocon are different branded products, but they serve the same purpose, and their components are essentially the same. 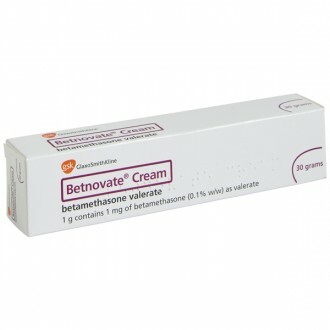 Novasone is available in Australia, whereas Elocon is available in the UK. Can Elocon lotion be used on the face? No. Elocon lotion should only be used on the scalp, it is too strong for use on the face. 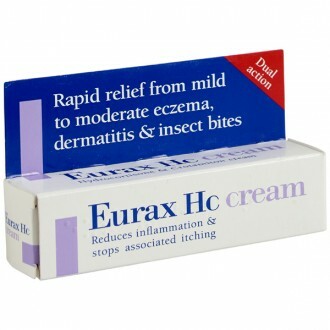 Can Elocon lotion be used for ringworm? No. 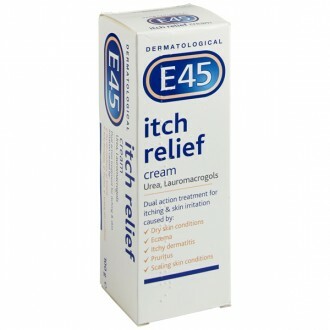 Elocon lotion should not be used for ringworm or any other fungal infections. 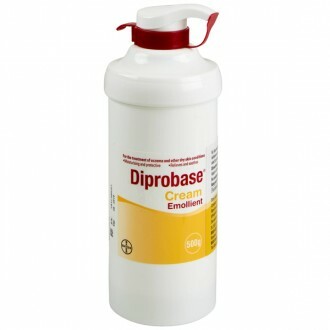 You should seek an anti-fungal preparation, such as Daktarin cream. Can Elocon lotion be bought over the counter, or do I need a prescription? 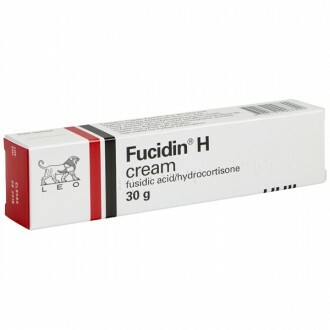 You will need a prescription to purchase Elocon lotion, as it is a very potent corticosteroid treatment. Consult your doctor to see if Elocon is right for you or go through a short consultation with our Online Doctor, the price includes a free private prescription. Can Elocon lotion be used on babies? No. Elocon is not recommended for use on children under 2 years old and cannot be provided online for patients under 18 years of age. Consult your doctor for alternative treatment options. Can Elocon lotion be used for acne? No. Elocon lotion can actually cause acne as a side effect in rare cases. To effectively treat acne, consider using a topical treatment such as Acnecide, Skinoren, or Duac. Can Elocon lotion fade dark spots? Elocon lotion can cause a reduction in skin colour as a side effect, but it should never be used for that specific reason as it can also damage the skin if used too much on one area. Can Elocon lotion be used on eyelids? No. You should not apply Elocon lotion on or around your eyes. Can Elocon lotion cause hair loss? No. If it affects hair growth at all, it stimulates it; one of the possible side effects is excessive hair growth (hypertrichosis), although this is very unlikely. Does Elocon lotion lighten skin? It can. One of the possible side of effects of Elocon lotion is loss of skin colour. It should absolutely not be used for this purpose, though. Yes. The expiry date is printed on the pack. The expiry date refers to the last date of that month. Do not use Elocon lotion after it has expired. Does Elocon lotion contain steroids? Yes. 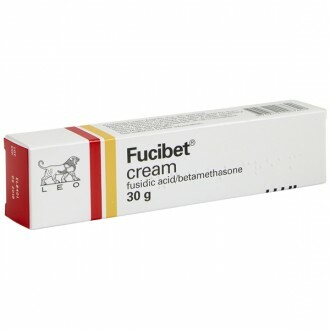 Elocon lotion contains a small amount (0.1% of the total) of mometasone furoate, a corticosteroid used to treat inflammation. Does Elocon lotion cause thin skin? 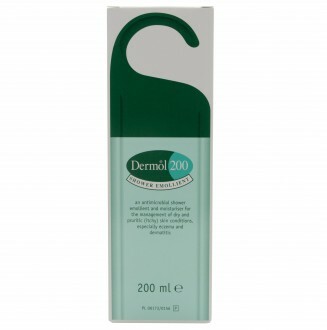 If used very heavily, or for extended periods, Elocon lotion can cause skin thinning. It is designed to be used sparingly and under advisement from a doctor, so be sure to get a treatment plan before you begin using Elocon. How does Elocon lotion work? It adjusts protein activity, slowing the activation of those that cause inflammation and hastening the secretion of those that reduce it. It works to stabilize the weakened cell membranes. It reduces the production of inflammatory cells. 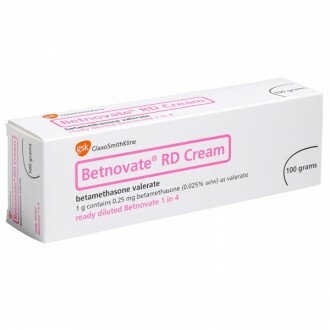 The net result is that the inflammation in the treated skin is reduced and the strength of the skin is bolstered, allowing it to more quickly heal to its normal state. Is Elocon lotion stronger than Betnovate? Elocon is generally considered slightly more potent than Betnovate, requiring fewer applications. It also achieves a higher patient satisfaction score. That said, trials have found that the two treatments have reasonably similar levels of efficacy if used appropriately. Is Elocon lotion safe during pregnancy? It depends on the case - normally it is not worth the risk. If you are pregnant and interested in using Elocon, consult your doctor to find out if it is a viable option for you. 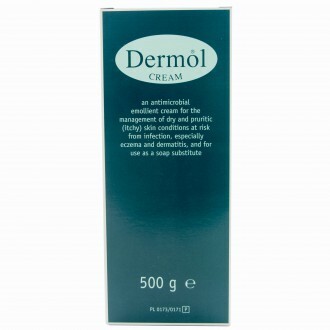 Is Elocon lotion stronger than Dermovate? 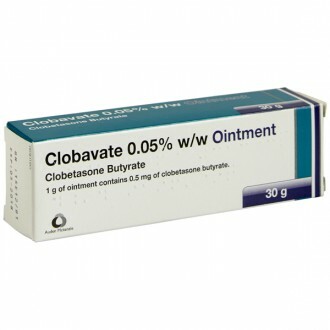 Clobetasol propionate, the active ingredient in Dermovate, is stronger than mometasone furoate, the active ingredient in Elocon, but it constitutes just 0.05% of the whole, as opposed to 0.1% for mometasone furoate. As a result, the two treatments tend to prove similarly effective, with Elocon meriting a higher patient satisfaction score on the whole. 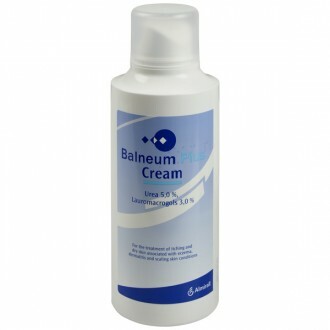 Is Elocon lotion used for haemorrhoids? No. Elocon lotion is specifically formulated for scalp treatment. 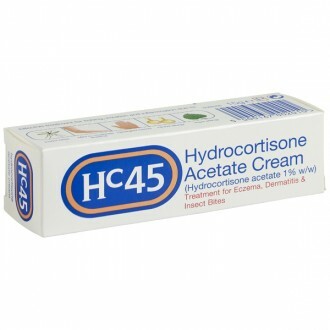 For relief from haemorrhoids, you should look at something like Scheriproct or Proctosedyl. Elocon lotion is manufactured in Belgium by Schering-Plough Labo NV and marketed by Merck Sharp & Dohme Limited.